Part of the appreciation of art goes beyond understanding the meaning of any one particular work. This admiration takes a deeper, awestruck form when we contemplate the passions that inspired the artist to create a particular image. What must have the artist felt as they were producing that work? Beyond the need to serve patrons, each great artist must also serve the passion that drove them to expression in the visual arts. Pioneering artists like Jan van Eyck and Hans Holbein The Younger gave us a sense of virtuouso artists being very much aware of their mesmerising talent. This is displayed wonderfully in Holbein's The Ambassadors, a phenomenal work that has been the subject of deep admiration and hot discussion from the time it was created. Through techniques used, Holbein demonstrates an astounding ability to convey powerful imagery using methods only practicable by inspired hands. 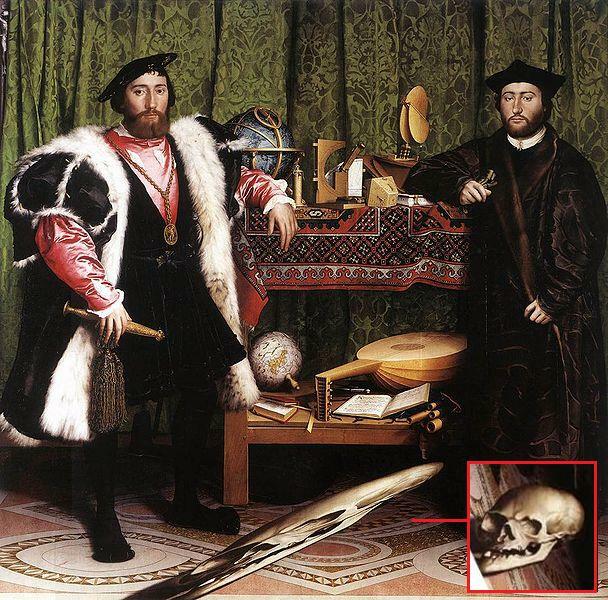 The Ambassadors is an astounding double portrait, containing many fabulous details - the most striking of which is the skull depicted in anamorphic perspective. Its prominent position in this painting reaches beyond an allegorical symbol of mortality, and allowed Holbein to flaunt his amazing skill to prospective patrons. 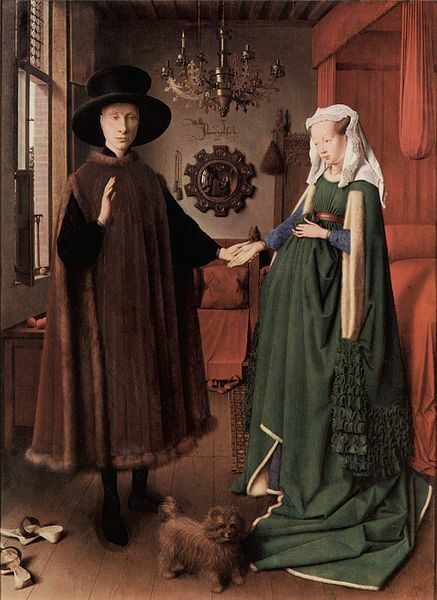 In Jan van Eyck's revolutionary The Arnolfini Marriage, so proud was the artist of his creation that he scribed his name elaborately in the background, literally stating "Jan van Eyck was here.1434" Closer inspection will also reveal a mirror behind the chief figures, the reflection in the mirror showing an added presence in the room - the artist himself. The mirror reflection from The Arnolfini Marriage. 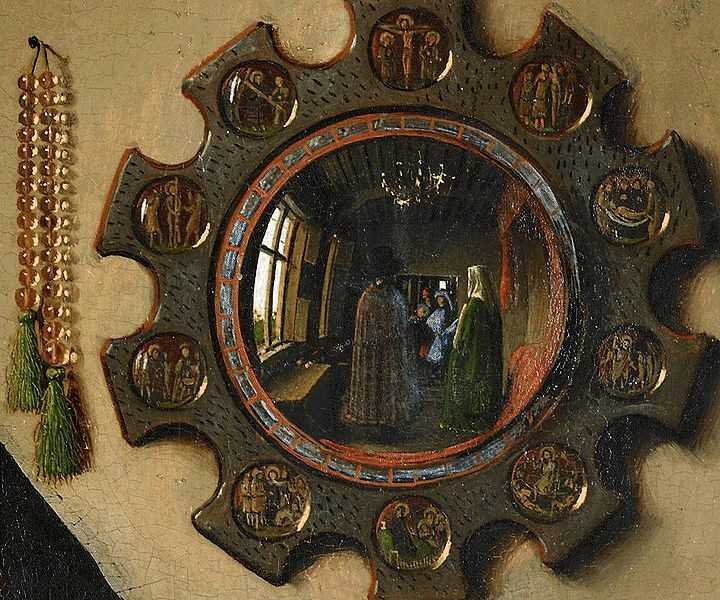 Van Eyck seems quite insistent on inserting himself into a family memorial portrait. As the Renaissance era painters honed their craft and became increasingly sought after, they began to play a more active part in their own work, often posing as key characters or onlookers on an important scene. 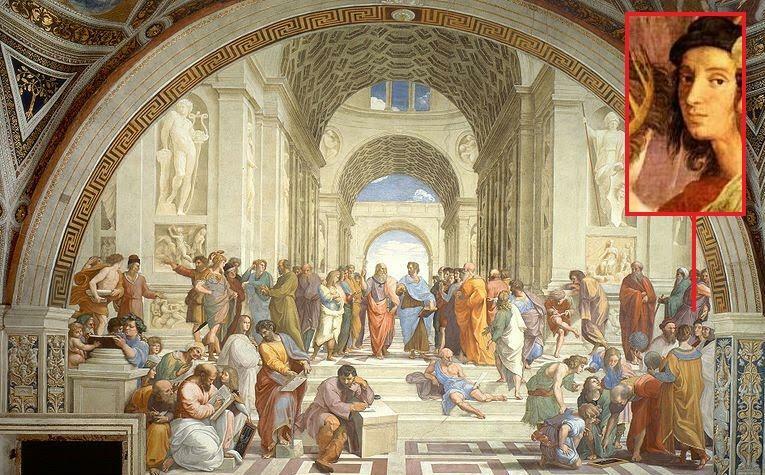 Previously discussed examples of this include Michelangelo's appearances in the Sistine Frescoes, Raphael's cameo as Apelles in The School of Athens and Tintoretto's observation of the Miracle of St Mark Freeing a Slave. Tintoretto places himself in the crowd observing the Miracle of St Mark, as described in the 13th Century Text, The Golden Legend. In Germany, Albrecht Dürer took this a step further, removing the entourage altogether and painting self portraits in exquisite detail. In an era where painters earnt their living from commissions, here was Dürer, happily spending many hours making himself the subject of his work. 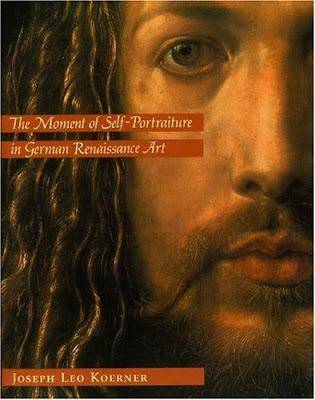 The purpose was clear, as one ecclesiastical Art commentator noted, "Dürer was showing off!" Dürer's self portrait painted in 1500 is truly monumental, an absolute celebration of self, in accordance with the Humanist ideals that were sweeping across Europe. Clad in fur, long flowing locks and a Christ-like visage. 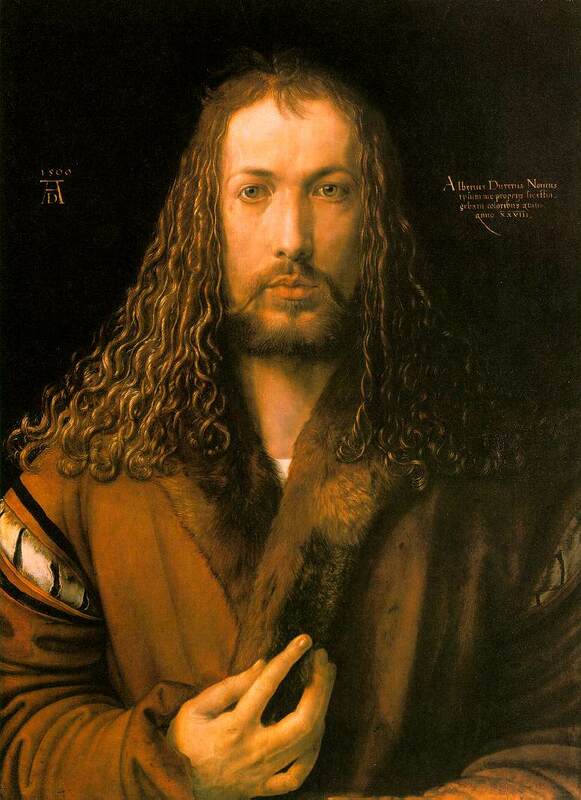 Albrecht Dürer's tremendous talent was matched closely by his ego. 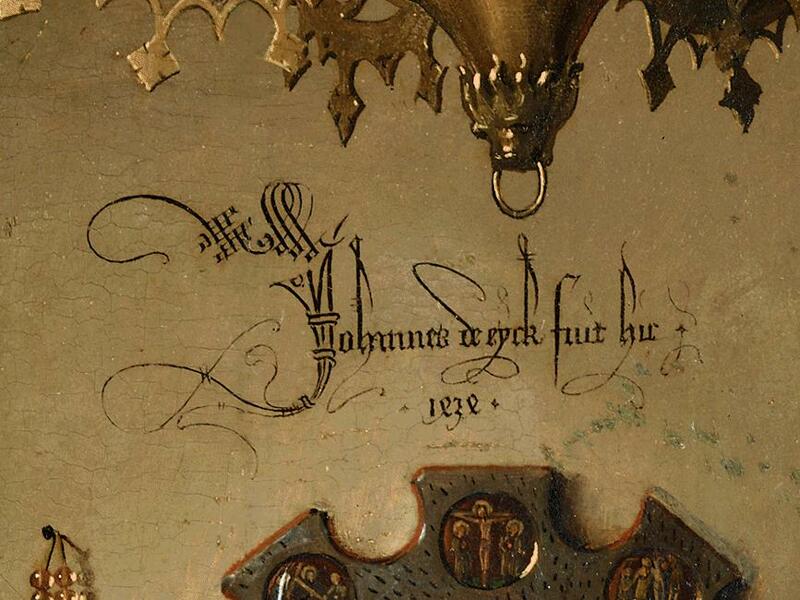 The Latin inscription reads: "I Albrecht Dürer of Nuremberg portrayed myself in colors aged twenty-eight years." These traditions were inherited by later artists such as Caravaggio(1571-1610), often depicting himself in his images. Whilst part of this is attributable to an artist's honing their craft by using themselves as a model - one must have a degree of egotism to be content to consistently recreate their own image. The most striking of these self portraits is David with the Head of Goliath(c.1610) with Caravaggio depicting himself as a most unhappy decapitated Goliath. 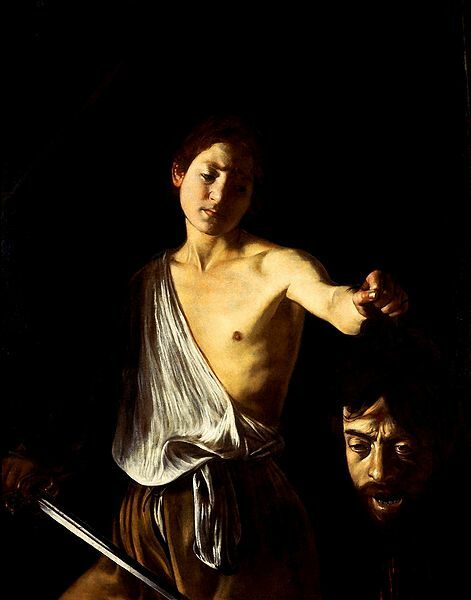 The ever troubled Caravaggio presents himself as the slain Goliath. Seeking pardon for Murder, this piece was planned as a gift to Cardinal Borghese from the Artist on his way back to Rome. Caravaggio's penitence not being enough for some, many fanciful interpreters like to read this painting as an ode to homosexual love. From this line of predecessors, Dutch Master Rembrandt van Rijn(1606-1669) rose to become the most prolific creator of self portraits to date. Whilst often depicted in character, Rembrandt was also confident to paint himself as a painter. It was a staggeringly important shift towards personal, more modern approaches to painting, setting the scene for landmark artworks from Vermeer to Van Gogh. Rembrandt's Self Portrait with Turned Up Collar(1659), one of almost fifty surviving self depictions, Rembrandt is the true father of the introspective self portrait. These are invaluable, not only for their realism and self commentary, but also as evidence of Rembrandt's experimentation with various techniques and media. Among the most fascinating of these works is An Artist in His Studio(1629). 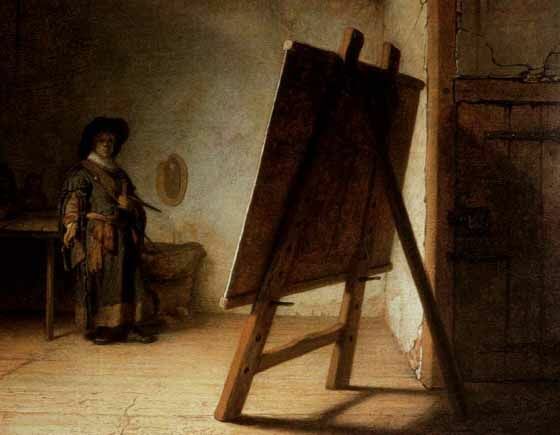 Painted earlier in Rembrandt's career, it depicts a young artist standing before an easel. The easel dominates the composition, and is depicted in a way suggesting the almost divine union of artists skill and the canvas. An equally valid interpretation of this work describes Rembrandt successfully capturing the notion of an idea. The inspiration that drives artists is elusive and powerful and is a fitting description of the easel and its hidden subject matter. Rembrandt was in effect announcing himself to the world. It was this confidence that earned him patrons that were to make him the most famous painter in Europe for a number of decades. In the latter part of his career, Rembrandt's fascination with evolving the art of painting did not gel with changing fashions, as the increasingly affluent Dutch demanded Art that was fanciful and decorative. The gritty thoughtfulness of Rembrandt had become irrelevant and the Dutch master spent his twilight years in financial distress. The deep visual introspection evident in Rembrandt's Artist In His Studio was to have a profound influence on artists that followed. The most famous example of this was fellow Dutch Painter Johannes Vermeer(1632-1675) and The Art of Painting(1662-1668). Vermeer shifts the perspective of the viewer, this time revealing the subject on the canvas and showing his mastery of his art in creating a detailed depiction of the subject before him. 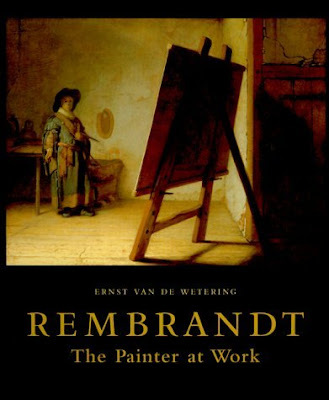 A wonderful interactive guide to this painting can be accessed from essentialvermeer.com. Contemporary to Vermeer, Spanish artist Velasquez took Van Eyck's mirror concept to the extreme, painting Las Meninas(1656) presented as a scene reflected in a mirror. 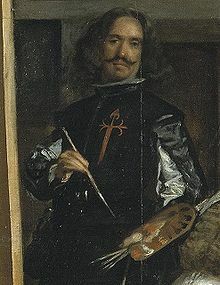 This reveals to us the proud Velasquez, palette in hand, surrounded by the Spanish Royal Family. 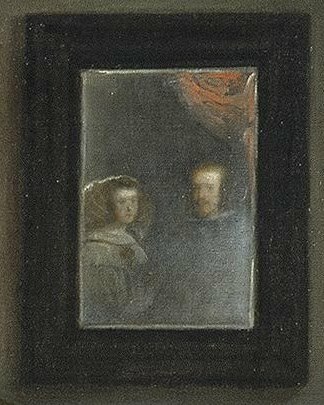 Rather than cram himself into a mirror like van Eyck, Velasquez instead shoves none other than the King and Queen of Spain into the looking glass at the centre of Las Meninas. The pensive introspection of the self portrait that found its origins in the world weary gaze of Rembrandt was the direct predecessor of the modern age of Art, with a deep, sometimes overwhelmingly personal focus. The most obvious example of this is another Dutch Painter - Vincent Van Gogh(1853-1890). Whether you are a fan of his style or not, the intense self examination that pervades his self portraits is a fascinating aspect of his work - and tells us much about Vincent as a man struggling to find his identity as an artist. The quintessential Van Gogh. 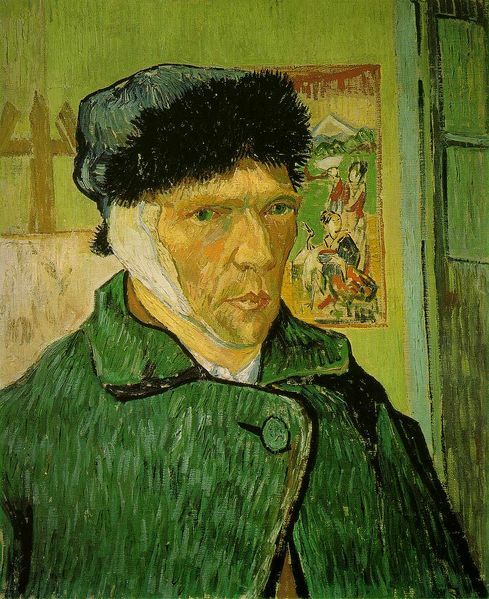 Self Portrait with Bandaged Ear(1889). No Royal Family staring proudly or optical trick flaunting here. Van Gogh was a mess and he wanted you to know it. The era of the romanticised self portrait was well and truly over. The most famous self portraitist of the 20th Century was undoubtedly Mexican artist Frida Kahlo(1907-1954), whose alarming and colorful images became iconic as depictions of womanhood, individualism and the human struggle against illness and mortality. 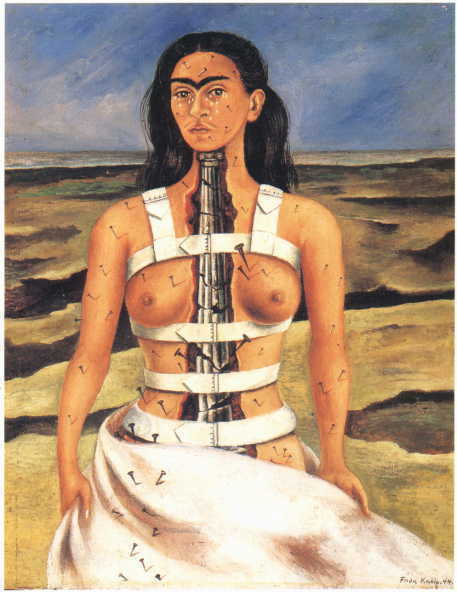 Frida Kahlo's The Broken Column(1944). In 1925, Frida was severely injured in a bus crash, which crushed bones in her spinal column. The pain which accompanied her for the rest of her life was a constant theme in her work. The evolution of the artists self portrait is a fascinating topic for those that like to examine the progression of art not only from a technical point of view, but also as a consideration of art as medium to reflect a pervading set of social values. The self portrait reduces the gap between the painter and their audience. What started as a means of flaunting an artist's talent evolved into a means of illustrating the very human frailties that are part of life. For Dürer fans wanting to explore the role of the self portrait in the German Renaissance, Joseph Koerner's The Moment of Self-Portraiture in German Renaissance Art(pub.1997) is a definitive and thoroughly enchanting read. 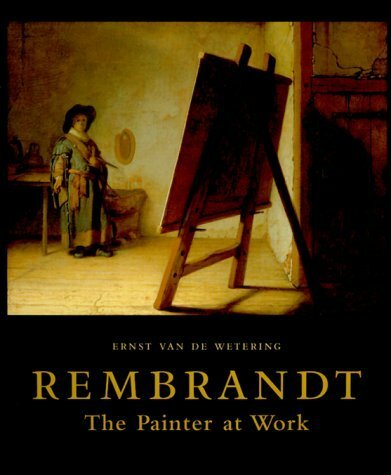 Without a doubt the most accomplished commentary on all things Rembrandt, Ernst Van De Wetering's Rembrandt -The Painter at Work(rev.2009) is unsurpassed in detail. A must for all lovers of the Dutch Master. This is a truly rich blogpost, most illuminating and comprehensive. Well done, Hasan! Rounding up and choosing art must take you hours! how do you manage? Also re: Frida. The soundtrack of the film was equally enchanting and had many very authentic artists on it. I listen to it frequently. Thanks for a real treat! Thank you for the lovely comments Vicki. These earlier posts that jump eras are my personal favourites. They very much reflect the way I think about Art and History, tying together common themes through time. 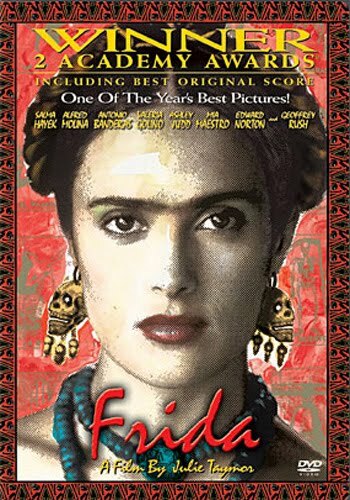 I too love the Frida soundtrack!! It's an interesting observation but the real question in my mind is: how did they get away with it? Why would someone pay a lot of money for a Rembrandt self portrait when they could have had a painting of themselves for the same amount? Today understand the value of those canvases much better, those paintings are masterpieces from many different angles, technically, artistically, etc. But back then paintings were most of the time vanitas objects and frequently just decoration pieces. Two of the artists discussed in this article were not even well known. Vermeer only became popular after his death and we assume the same of van Gogh. Stronger still, why did Velasquez get away with portraying himself more prominent than the monarch and his wife? Or why did he get away with portraying the monarch in such a direct confronting way when most of the kings and queens of that period wanted themselves to be displayed in a more favorable light? Personally I'm not convinced a self portrait gives a good understanding of the artist. Why would artists who have spent their lives enhancing reality in some form or another depict themselves in any other way than the form they chose for their other subjects? 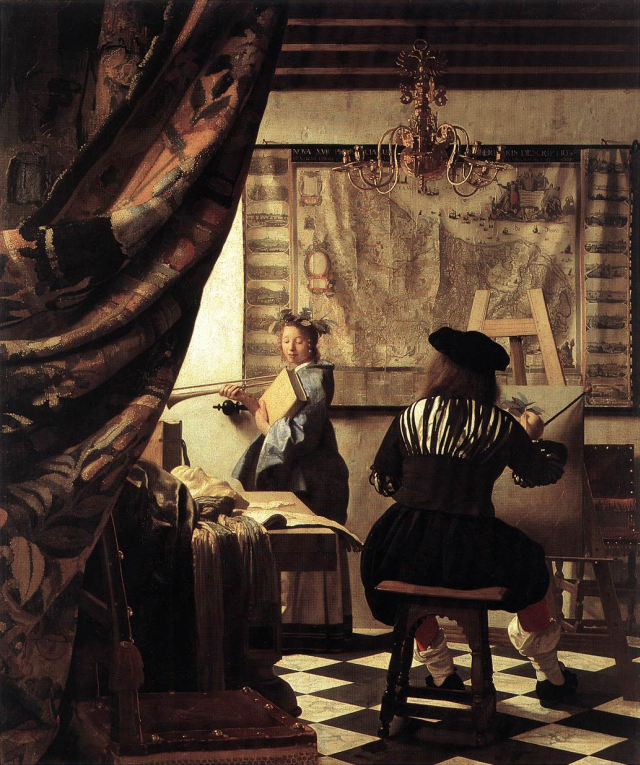 Vermeer, although realistically in appearance, changed the elements of his paintings drastically. We know he did this with perspective, object placement, etc. So why would he not have done so with people? I would argue the same goes for the other artists. The reason this is difficult to perceive is because they were such masters of illumination and they needed a subject to try their skills on: themselves. 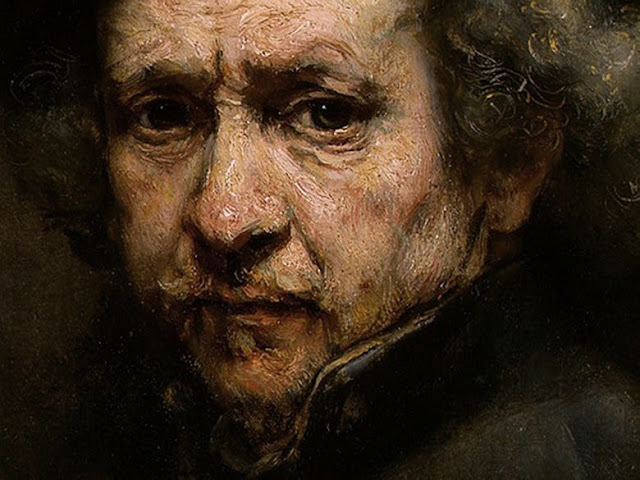 So when we look at a Rembrandt self portrait I'm inclined to say we're looking at a self study with enhancements. i really really really enjoyed visiting this site. Many of the rembrandt self portraits were experimental pieces and not sought by collectors until much later. 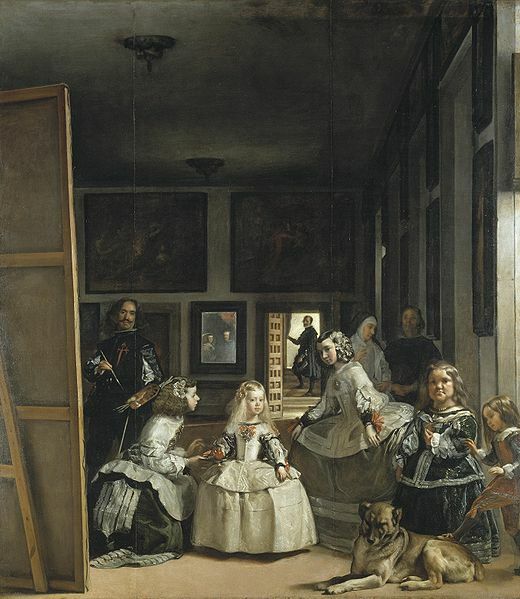 Your point on Las Meninas is very interesting - I imagine by that time in his career Velasquez was very well established in the Court, so was allowed a bit of self indulgence. That being said, the King and Queen were still at the heart of the painting, and the little Princess is the real star of the panting. @Anonymous: cheers for the wonderful feedback! Stay tuned, more to come! !